Hraunfossar waterfalls run down from the brims of the rugged Hallmundarhraun lava field and into Hvítá River in Borgarfjörður. 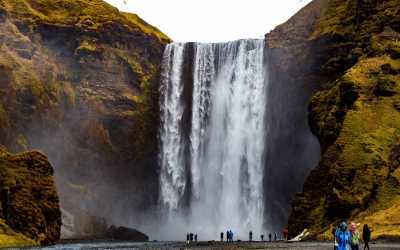 They are often listed as one of the top most beautiful waterfalls in Iceland and deservingly so. These incredibly blue waters originate in Langjökull glacier, the 2nd largest glacier in Iceland. 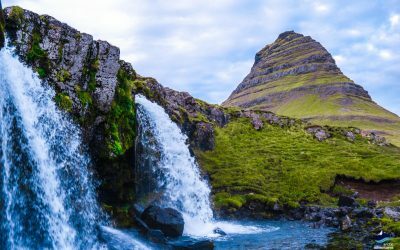 The waterfall is a must do when visiting Borgarfjörður and one of the important stops on the Silver Circle Tour. 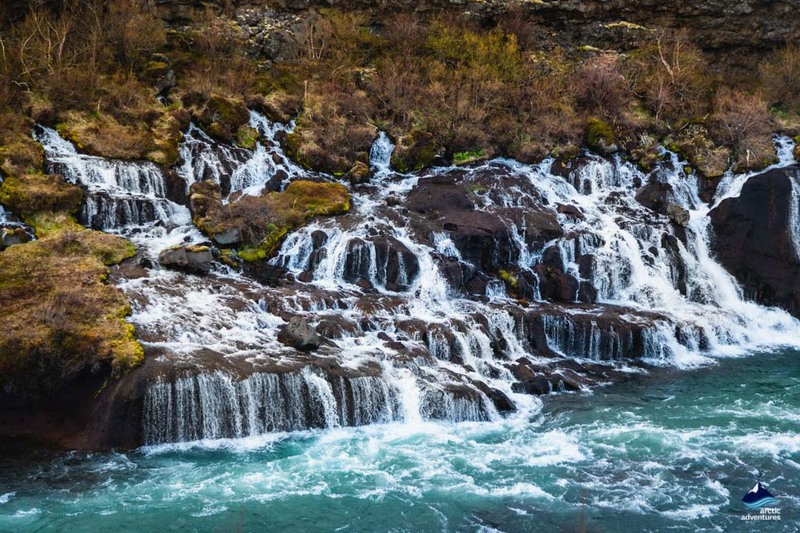 What does the name Hraunfossar mean? 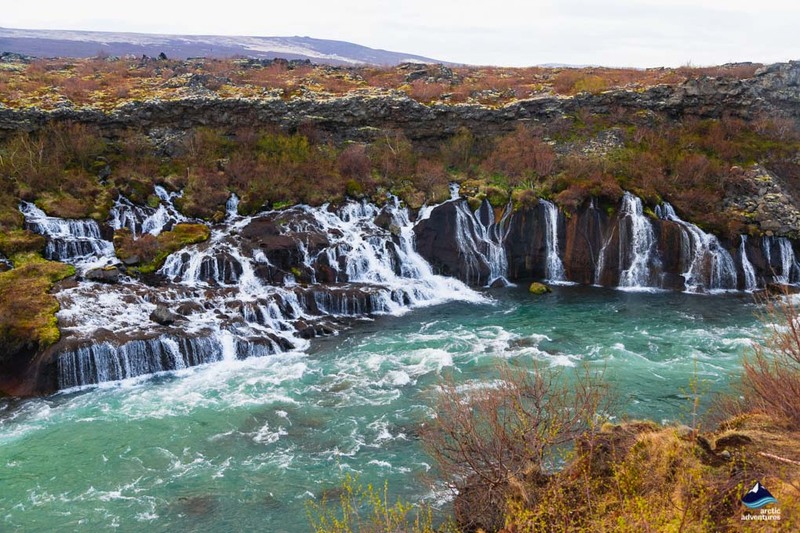 How to get to Hraunfossar? What not to do at Hraunfossar? 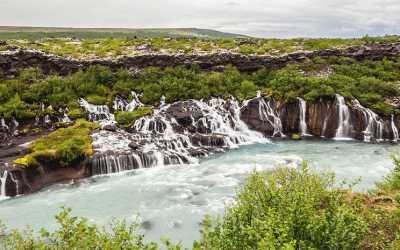 Where to stay near Hraunfossar? 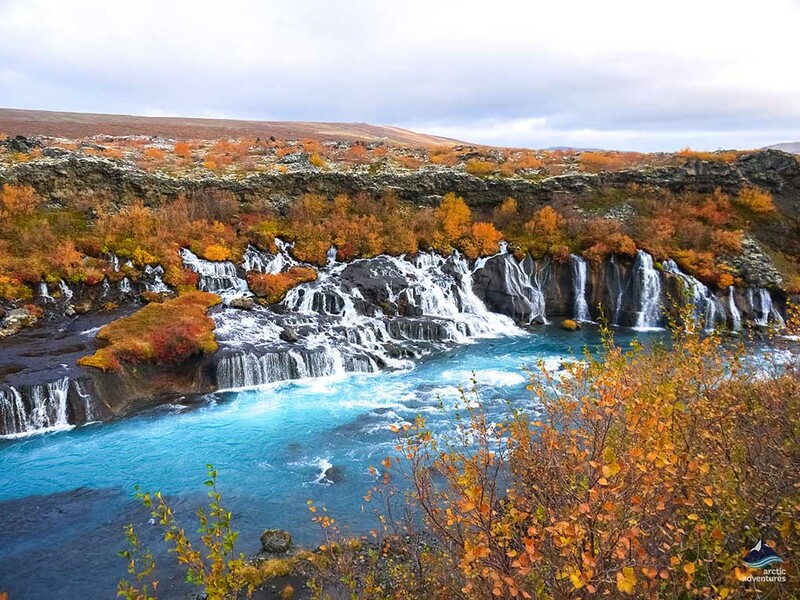 The awe-inspiring Hraunfossar waterfalls are located in the enchanting Hallmundarhraun lava field in Borgarfjörður bay, West-Iceland. 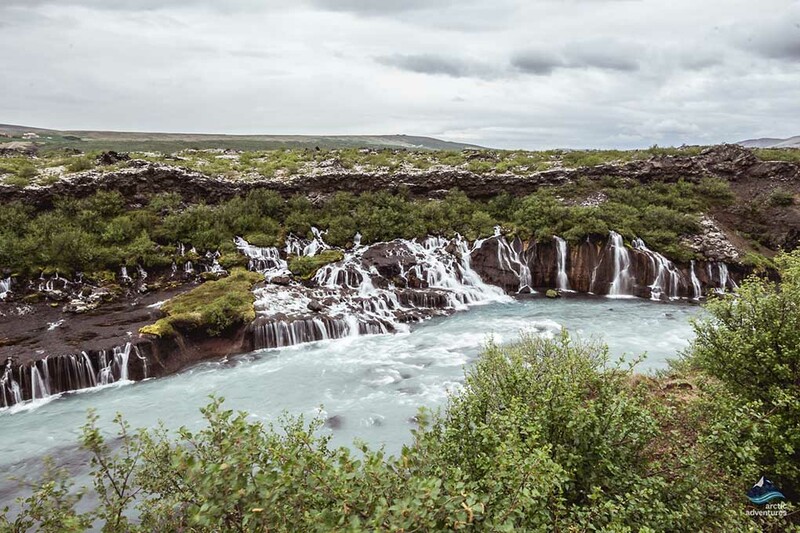 The stunning white uncountable falls run in a cascade series down a lava cliff of about 900 meters wide. 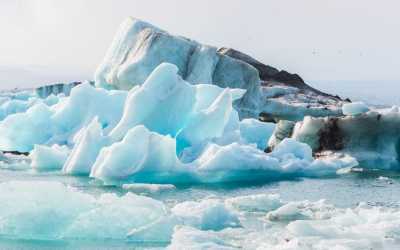 The water originates from Langjökull glacier, the second largest glacier in Iceland, therefore, making it the twin brother to the powerful Gullfoss waterfall. The glacial meltwater has to travel quite a long distance to Hallmundarhraun filtering through the lava field and spouting out again in an incredible water array. 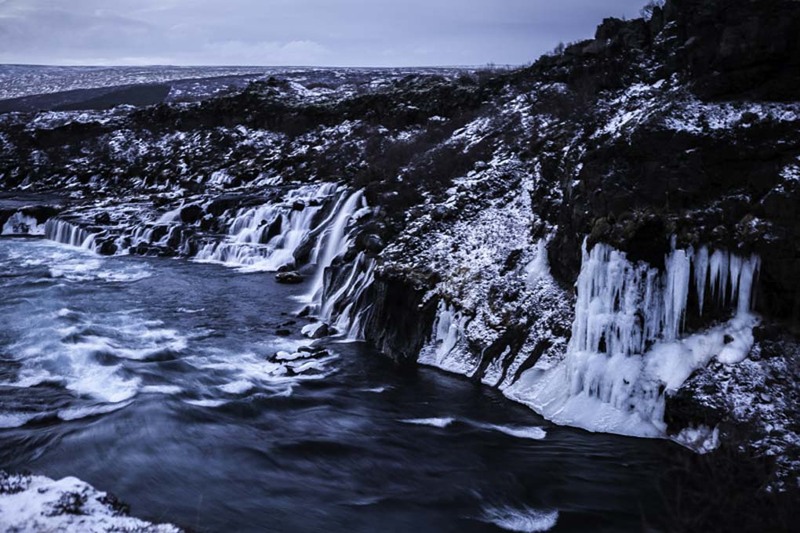 From there the water runs into the famous Hvítá river which despite its name (Hvítá meaning white river) is not white at all. 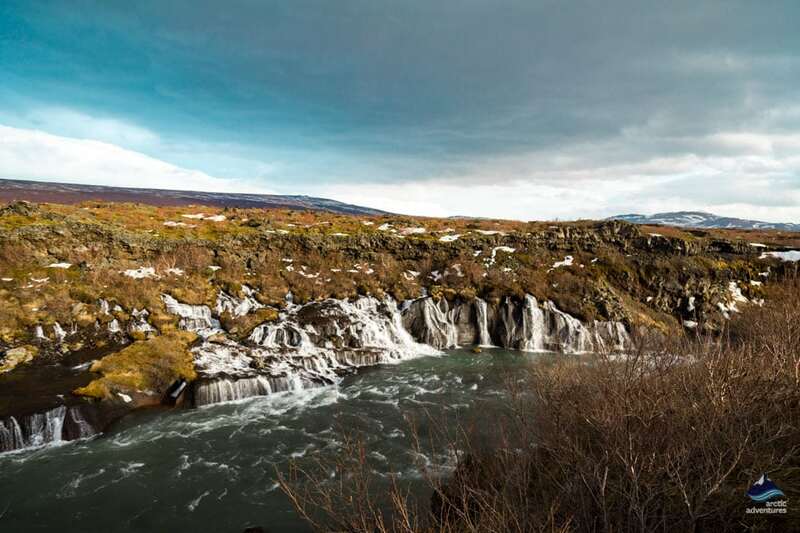 There is a viewing platform only a short distance away from the car park that provides you with the most amazing view over the waterfall, the flowing river, and the surrounding flora. The pedestrian bridge across the river was originally built in the year 1891 and renovated exactly a century later. The waterfalls have been protected as a National Monument since the year 1987. Almost any word you find in the Icelandic vocabulary will have a see-through meaning, so once you start understanding a bit you will understand a lot more quickly. 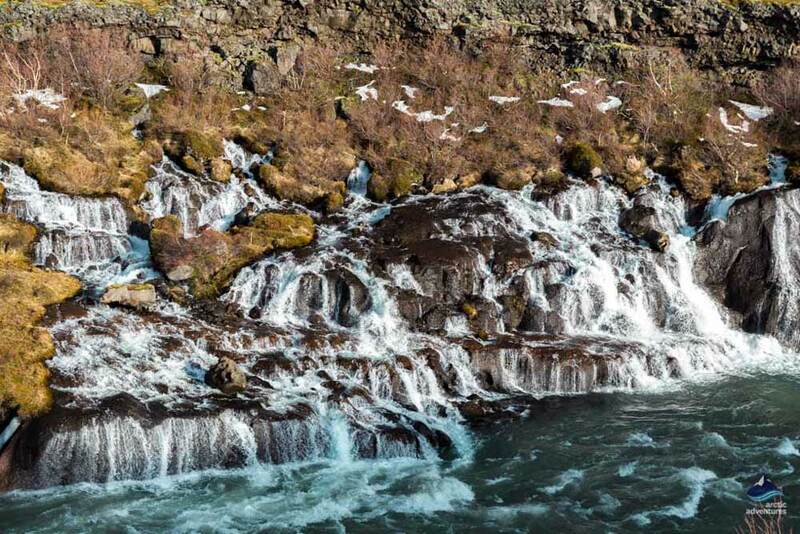 Words are usually a combination of the exacts thing it is trying to describe and Hraunfossar is an excellent example of this. 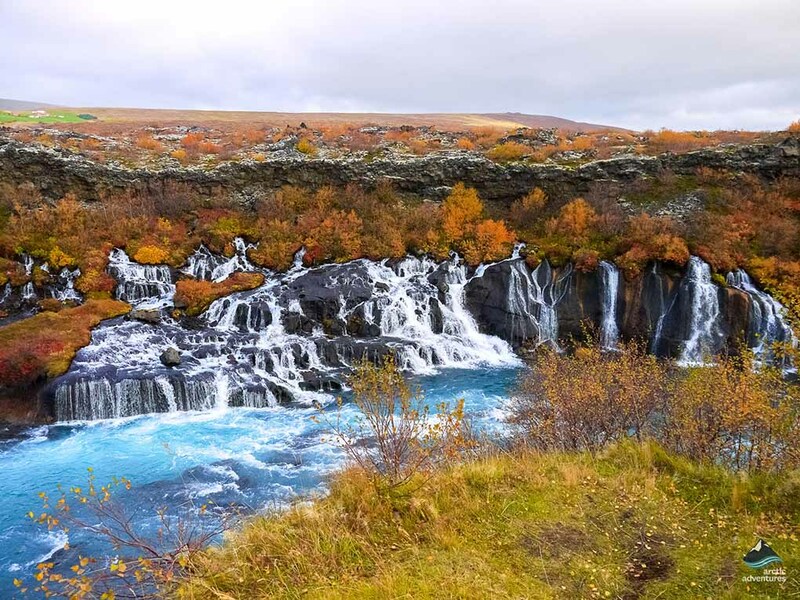 Hraun means lava and fossar mean waterfalls, so the name basically means Lava Waterfalls. 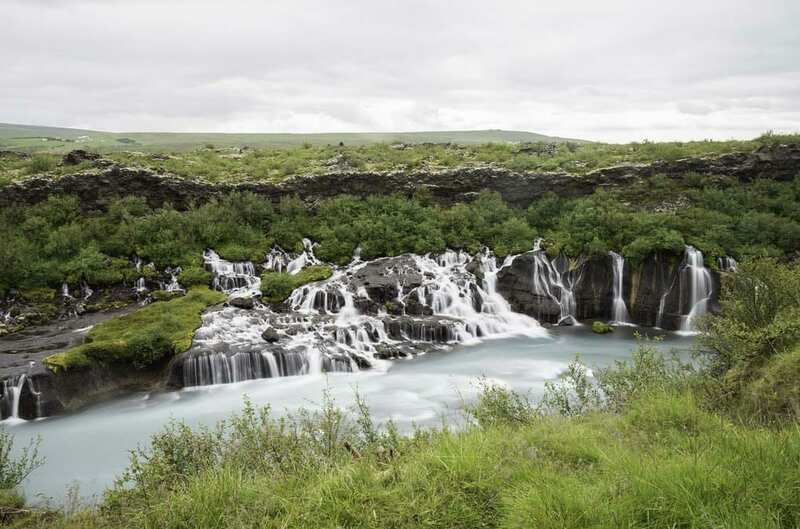 The waterfalls come down from under Hallmundarhraun lava field so the name is very fitting. 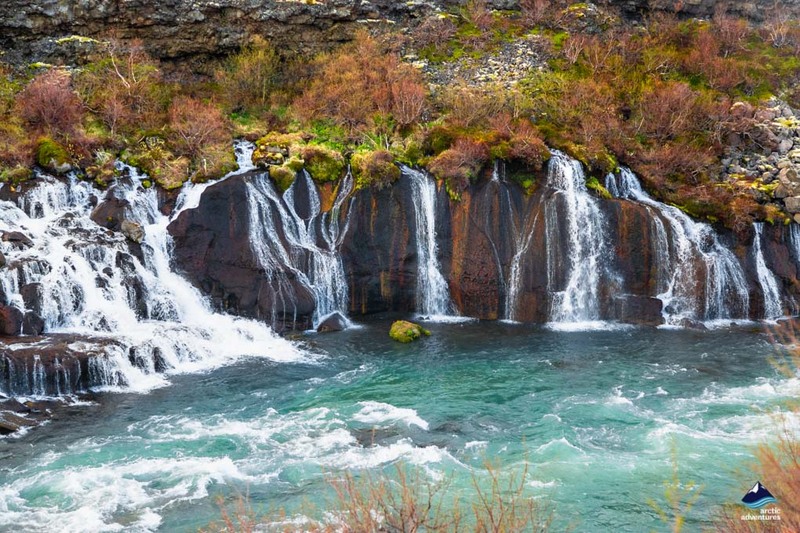 The waterfalls are located in Borgarfjörður the West part of Iceland about 118,5 km away from Reykjavík. 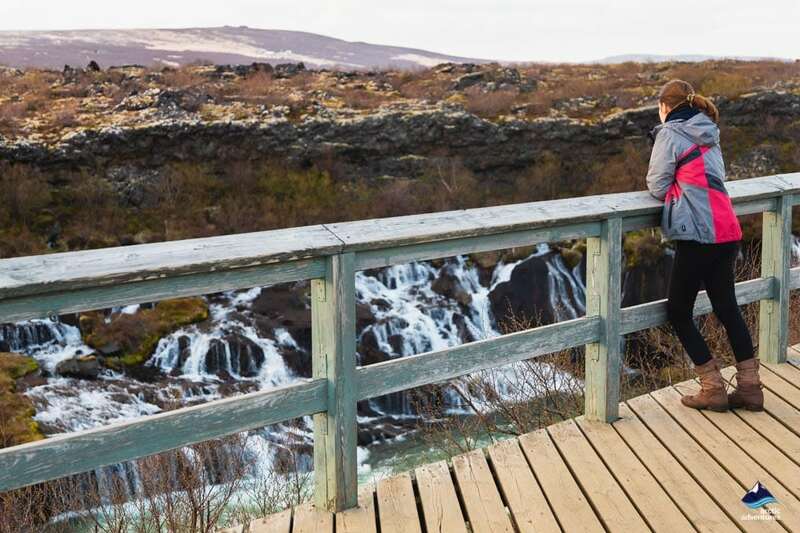 It is close to other incredible sights including Húsafell and the historical Reykholt once home to the poet and historian Snorri Sturluson. 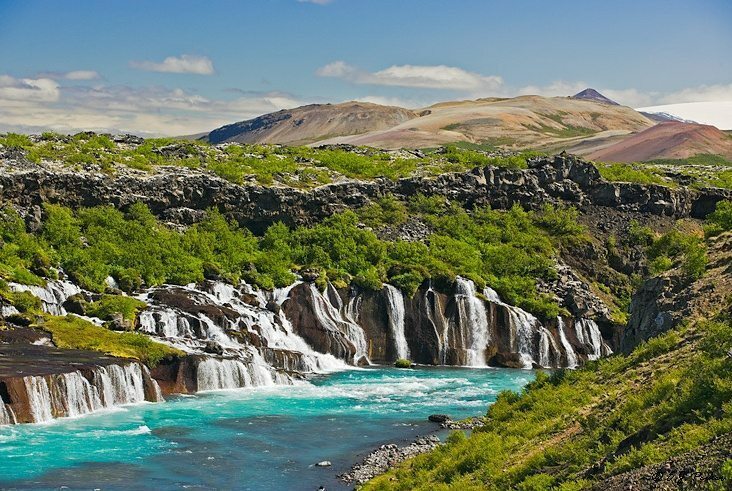 Driving from Reykjavík to Hraunfossar will take about an hour and a half. Getting there is easy and the way is well marked. The drive will take you through Mosfellsbær, past the beautiful Mt. Esja, and through the undersea tunnel Hvalfjarðargöng. You will pass the aluminum plant at Grundartangi and mt. Akrafjall and onwards go towards Borgarfjörður. At the bridge crossing to Borgarnes, you will make a right turn inland driving through the stunning countryside for about 55 kilometers. Past Kleppjárnsreykir and Reykholt until you reach Hraunfossar. Hallmundarhraun is named after a giant that lived in the Lava field names Hallmundur. This sort of naming is very common in Iceland giving a clue to how important folklore and mythical creatures have been in the culture. The Lava field is very young, formed after the settlement of Iceland. 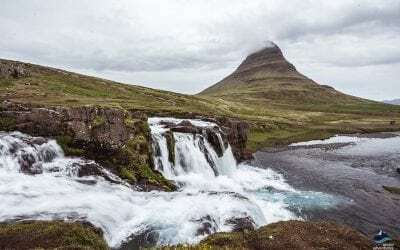 This is known because the first set layer underneath the lava field is ash called the “settlement ash” known to have settled in similar times as Skallagrímur and other Vikings traveled in the Borgarfjörður region for the first time. Litter! It’s very important that you don’t litter whilst exploring remote paradise. It is extremely clean and untouched and we would like to keep it that way. Go off the trails! The surrounding area is very sensitive and can quickly show if anyone wonders of the roads so please try to stay on the trails. 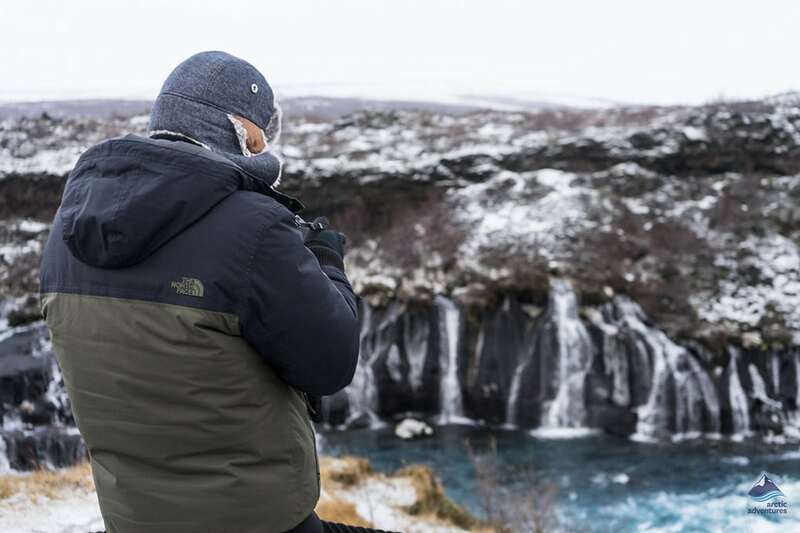 Visiting Hraunfossar in winter is definitely a great idea! Watching the icicles and frosty colors along with a cascade of snow white water chutes is truly a visual treat and well worth the day trip. 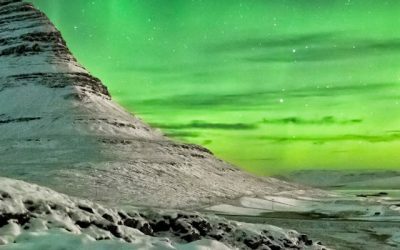 Chances are that if you are traveling to Iceland during this time period you actually want to experience a touch of a winter wonderland and traveling to a location such as this one will surely deliver. 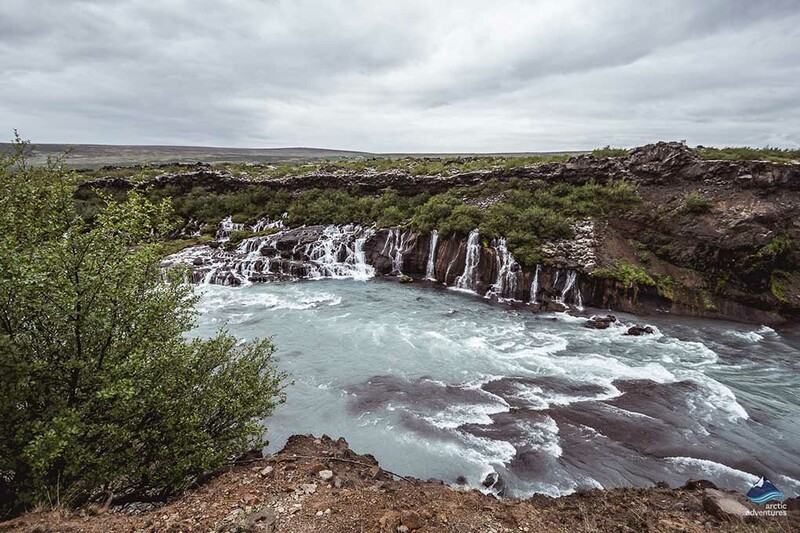 The Ring Road might be a bit slippery so if you aren’t used to driving in circumstances such as those we would recommend joining one of the many tours exploring the falls (see below). 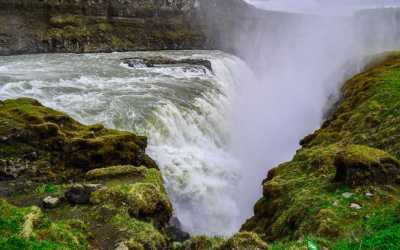 Here are the accommodation options with the best reviews and rating near Hraunfossar waterfalls, the highest being the nearest in each category. Húsafell Camping site has been popular for decades. Located in the middle of a cottage zone it is within a walking distance from a playground, golf course, a swimming pool, a restaurant, and bar. Facilities include running hot and cold water, electricity (1100 ISK), Wifi, washers, showers, and walking paths. Price per adult per night is 1500 ISK. Hverir, Kleppjarnsreykjum is another camping site close to the falls. It is located in a cozy oasis surrounded by small shrubs. The facilities include running hot and cold water, hot tubs, washers (500 ISK), tumble dryers (500 ISK), showers, Wcs, a swimming pool, walking paths, a restaurant, a playground and electricity (1100 ISK). Open 30th of March through the 30th of September. 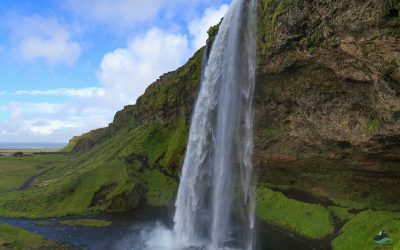 We have carefully planned the perfect 4 day itinerary for you to enjoy while traveling in Iceland. 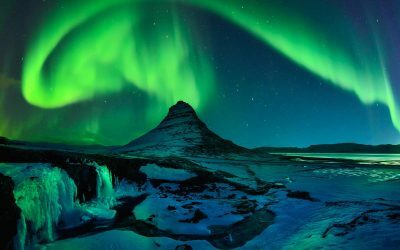 Get inspired by stunning vistas and see the most extraordinary locations and sights Iceland has to offer.